Thanks to Jason, Kendal, Corinne, and Mike last weekend and Chuck, Blue, and Tad this weekend we have the 30 solar panels installed on the RiverStreet Bakery’s roof. Pictures here. Click on “River Street Bakery Details”. Now we need to do a bit of wiring and get the electrician to install the new utility meter enclosures and connects us up to the breaker panel. 6KW of solar power is on it’s way..
Well it’s taken a long time, but we’re making progress on the solar installation for the River Street Bakery at the Ypsi Food Coop. The metal rack for the panels is finished. Hopefully this week we’ll get the solar panels up there and start the wiring. Pictures here. Click on “River Street Bakery Details”. 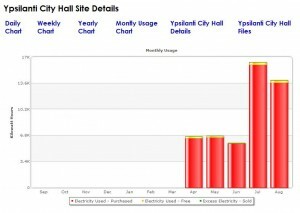 I was looking at the monthly bar charts for the City of Ypsilanti’s City Hall and calculate that they are now about 2% solar powered. If you go to the chart here and hover your mouse over the bars, it will show you the numerical value of that bar. Doing this for all the bars for both the red and yellow parts I get these numbers. You can really see the air conditioning kicking in during the summer. If I average the percent solar, City Hall is about 2.6% solar powered. Pretty close to my guess of 2%. When some more energy conservation, we hope that percentage goes up.